Coral are aragonite skeletons of colonies of some marine Coelenterata organisms (their thickness to 1,5 mm) aragonite. These skeletons consist of hard calcite or aragonite, which invertebrate polypuses synthesize, processing salts of salt water. They grow very slowly, approximately 75 mm in a year. Coral is obtained in very fars. Main diagnostic signs it is been reaction with acid, presence of zonal or reticulated picture, special grainy structure. 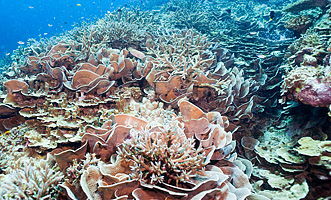 There is a lot of different types of polypuses, formative coral buildings which compose reefs and atolls. Skeleton aragonite of marine animals (usually rose and red colors). At a purchase it is needed to show circumspection - coral can be counterfeited through the painted opaque glass (flowed heavier, more cold and harder than coral). Coral are turned (shallow pieces or saving elements of skeletal structure) and pressed (exactly from the pressed coral often make large round beads). Before for the receipt of rose corals from crimson they were sometimes bleached, and today corals can paint in more intensive and fashionable red color. If to pound natural corals in powder and add vinegar, the bubbles of carbon dioxide will be selected, because basis of swingeing majority of corals is made by the limeolith of aragonite CaCO3 (unlike vitreous product, glass or plastic imitation). Unlike an ordinary chalk corals are hard and can be porous. Polypuses-corals select the special lime substance which dendritic coral branches are formed from. They can arrive at forty centimetres in length, the thickness of branches arrives at four centimetres very rarely (1-1,5 sm is ordinary). Only in the places of fork they can be a bit thicker. Untilled corals are always mat. They get the brilliance due to a polish. They are porous often, pierced cracks and holes. Them processed by the coloured beeswax and dyes, to improve their original appearance. Coral of good value have an even color and free of cracks, spots, bars and holes (with equal success it also can talk and at imitations or to pressing of corals). The most valuable part is an apex of coral branches. Hardness Mohs of corals of the best quality 3,5-4. Brilliance is mat, on the polished surfaces - glass, in a fracture sometimes fat. 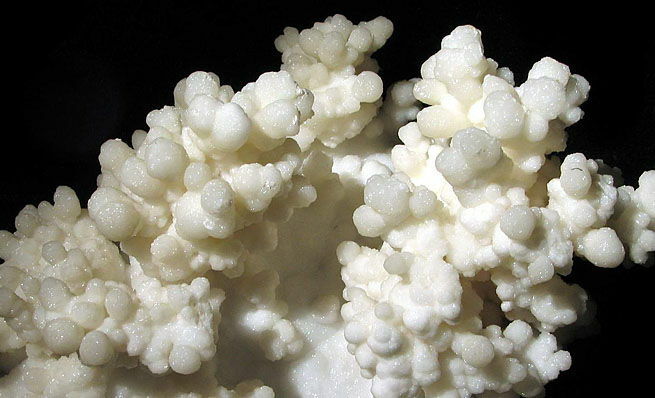 Coral aragonite live on a depth from three (shallow) to three hundred (deep-water) meters in waters of Japan, Taiwan, north-eastern Australia, Malay archipelago, in the Red and Mediterranean seas, in the Bay of Biscay, at Canary and Maldives islands, at the banks of Sardinia, Tunis, Algeria, Yugoslavia and Turkey. As well as Pearls, they belong to organic materials. Interesting phenomenon: both these the product of water chemically closely between itself and both are more than in 85% from a calcspar (calcite), finding out a radially-radiant structure in the crossrunner of branches. Coral have natural white, pink, rose, red and other colors. Porous coral is cheaper. Most dear - deep-water corals. 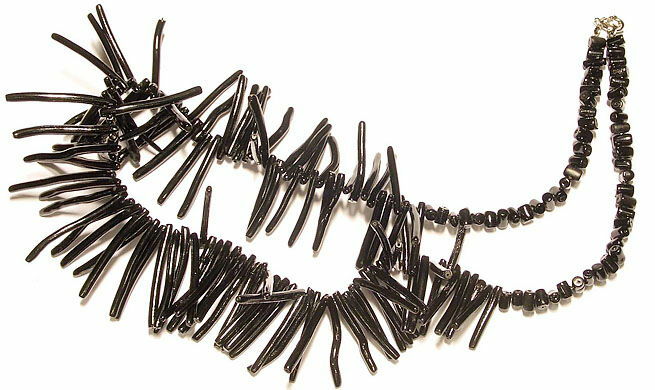 The dearest and valuable is black coral (an organic matter in him sometimes is almost 100%). Coral is a favourite decoration from deep antiquity. The beads of rose coral are found in the cave of Vildsheyer on the stand of epoch of paleolith. Ancient greeks counted pink, rose coral by character of immortality and happiness. It was in middle ages considered that coral did a people wise, prevents a misfortune. In our time coral is highly valued jewellers of the whole world. Large popularity of corals results in that they are predatory exterminated - quick, than grow, in this connection a question very actual about defence of corals. 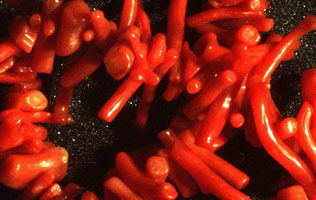 Besides corals with the natural colouring, the ennobled aragonite corals are used, artificially superficially painted in the desired color (more frequent all of bright-red). In France (EU) P. Zhilson developed the method of receipt of artificial corals of eight flowers - red, light pink, inconspicuous-yellow gold, white, colors of bovine blood, salmon, skin of angel, champagne. Natural aragonite Calcite and dye used for creation of artificial coral. Necessary terms: high pressure and adequate temperatures. Artificial corals in oftentimes cheaper natural the same color and quality. Because they are not the product of vital functions of living organisms, they can be examined as a successful imitation of corals with near properties and original appearance. Absence of the reticulated picture, characteristic for natural corals serves as one of important distinctive signs of corals of P.Zhilson. Organic inclusion does not contain. 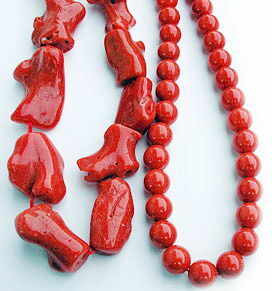 Coral were especially popular in Ukraine (Europe, CIS) in the last centuries as mandatory member of the national Ukrainian clothes of well-to-do women - exactly coral beads "namisto" (red and especially rose coral round beads) already a few ages traditionally are the unchanging attribute of the Ukrainian national suit. To corals a lot of legends and popular belief, superstition is related. In many countries, including for ancient Greeks, rose corals were characters of immortality and happiness. It is considered that corals beneficially operate on the psyche of people, instrumental in development of logic and intuition. In medieval Europe coral was character of modesty. In obedience to Greek and Roman legends coral at times was found in dragon a brain. Possibly, therefore on Russia coral was considered a prophetic stone. It is a wonderful amulet for children. As guarded guards a proprietor from lightnings, bad people, can even take off spoilages. Coral gives a proprietor wisdom, and to the spoiled people is a modesty. Talisman of romanticisms, it actively influences on imagination, gives an owner grace and fineness of perception. Guarded travelers, delivers them from hurricanes, storms, unpleasant meetings and well returns home. In Japan powder from white corals is used for the acceleration of cicatrization of breaks of bones, in dental prosthetics. The plants fed up aragonite coral possess large endurance and fecundity (but it is better to use a traditional dead lime). Coral aragonite is carried, to make internal changes. It is considered that aragonite corals are diminished by tension and fear and assist happy joint life. It disperses foolishness, nervousness, fear, depression, ideas about murder and suicide, panic and nightmares, gives prudence, bravery and wisdom. Coral is used for bringing in of success. Also strengthens the gift of foresight. Talisman of romanticisms, it actively influences on imagination, gives an owner grace and fineness of perception.